Last Monday the club was presented with a further cheque for £727 by Asda following a succesful grant application to the Asda Foundation. The Club is extremely grateful to Karen Thomas (Community Engagement Champion) at Asda Tonypandy, and also the Asda Foundation for the support we have received in recent months. The money has already been used to purchase new kits for our U10 and U12 squads and we are in the process of ordering new kit for the U14 squads and also new match balls. On 14/05/17, the USW / Tigers Womens Basketball team won the inaugural South Wales Basketball Associations Womens League with a narrow win 48-45 over second placed Butetown Dragons. The team comprising current and former students from University of South Wales at Treforest, and coached by Dave, with Katie as an assistant coach and player, went through the season losing only one league match (against Swansea Uni Storm) which set them up with the league decider against Butetown Dragons. Details of the game are under the Fixtures and Results tab and photos are on the Photo Gallery tab. Tonyrefail Leisure Cente is undergoing a major refurbishment which results in us losing half the basketball court for the next three months. There are no other courts in the Tonyrefail area that we can use instead so please bear with us and continue to turn up to training with the Club. The three months will soon pass and then we will be back to normal and will be able to train and play on a full court again. Last night saw our annual 2015/16 awards presentation.. Congratulations to all the players on a fantastic season..
Tigers players on Welsh duty. 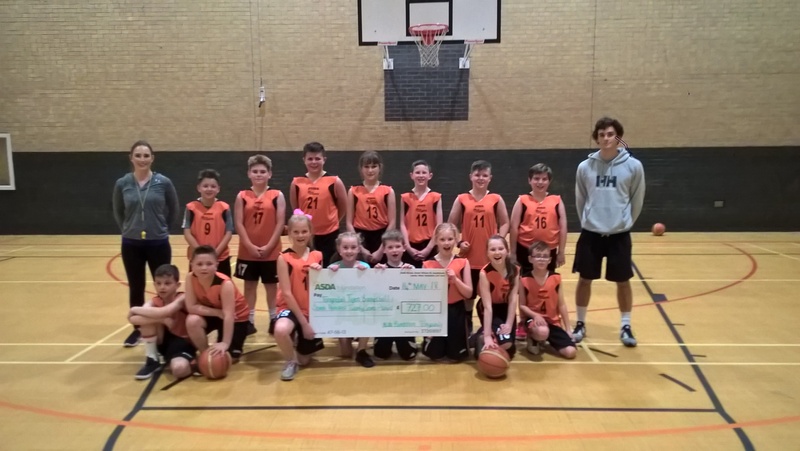 There was a great festival of basketball at the Surrey sports park last weekend, as the English Basketball Association held their inter regional tournament, and invited the Welsh junior squads to participate. Three Tigers players were involved in the Welsh squads. On Saturday Ben Evans played for the Welsh U14's who were playing up in age against U15 teams from Surrey, Sussex, Herts and Kent.... Unfortunately the Welsh team played 3 and lost 3 but they certainly did themselves proud and battled hard against much bigger sides. On Sunday morning Jacob Gibbons played for the Welsh U11's who lost to Surrey & Sussex but came away with a win against Kent.... This resulted in the U11’s finishing in third place. Also on Sunday Ben Evans and Dewi Hobbs played for the Welsh U13's, who won 3 of their games against Surrey (22-14), Kent (32-14), Sussex (24-18) but unfortunately lost their last game in a tense encounter to Herts by a single point 17-18. However even though they were tied 3 wins each with Surrey, the Welsh team were winners of the tournament by fact that they beat Surrey in their first game. Big congratulations to Tigers players Rhys Evans and James Large who have both won Most Valuable Player awards in the South Wales Basketball Association (SWBA) for this last season. Rhys Evans topped the list to win the award as overall MVP in the Mens U16 League, and James Large topped the list to win the award as overall MVP in the Mens U18 League. Presentation of the awards will be at the SWBA AGM this Sunday. Tigers U16 finished in 4th spot in the South Wales League and on Saturday 23/04 at 1:30pm, they meet League Winners Swansea Storm in the Play Off Semi Final. The winners will meet the winners of Cardiff Archers v Vale Vipers which is at 3:00pm on Saturday. The Final is on Sunday 25/04 at 11:00am.